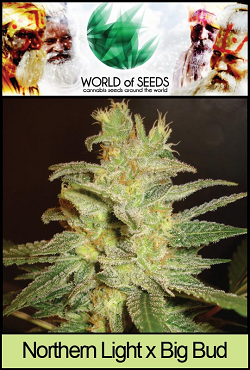 World of Seeds Northern Lights x Big Bud contains two of the most highly prized and stable strains, both with long and successful histories. Developed from the Cannabis Cup winning Northern Lights of 1988,1989 and 1990, bred with one of the highest yielding strains of the late 1980’s and up to the present day, Big Bud. Offering the commercial yields notorious with the Big Bud strain, together with the resination, stability and potency of the Northern Lights, World Of Seeds Northern Lights x Big Bud is the perfect strain for indoor growers looking for maximum yield without compromising quality. Perfect in almost any environment, these Cannabis seeds are an ideal choice for both the hobby gardener and more commercial grower alike. If you’re looking for good quality and exceptional yields, these are the seeds for you. Northern Lights x Big Bud is also highly rated as Medical Marijuana and is an ideal solution for stress relief and anxiety with a balance of cannabinoids. With high levels of CBD, the high is not overpowering, perfect for therapeutic and daytime use. Indoor growers are often surprised by the short flowering time of only 45 – 55 days, though this is due to the prominent Indica genetics supplied courtesy of the Northern Lights. Both mold and disease resistant, Northern Lights x Big Bud is the perfect choice for any gardener looking for a quick cash-crop. You can find more strains and Cannabis Seeds at The Original Sensible Seeds Company, one of the oldest and most trusted suppliers of genuine Cannabis seeds to Europe, Canada and the USA, click below to discover the complete selection from World of Seeds, and receive Northern Lights x Big Bud seeds free with every order now.